If you have plans to buy a new digital SLR camera, then you need to consider a new camera to be launched by Canon competitor, the Nikon D7200. This camera is the successor to forget the D7100, and according to the hot news on the Internet, this new Nikon will be strengthened with features like RAW buffer is at least a triple-sized, AF-ON button and enhanced video. Are you ready? According to Nikon Rumors, they expect a new D7200 to be released sometime this year. Most likely after the summer, possibly at Photokina in September 2014. Along with the launch of D7200, Nikon also rumored to also be releasing lens DX f/1.8 zoom lens to compete with the Sigma 18-35mm f/1.8. The 1.8 lens zooms issued awesome Sigma known, and less noticed by Nikon and Canon, so if Nikon will make a similar lens, the Nikon lovers will be welcomed with enthusiasm. The only way a D7200 might happen this year has to do with the D300s. The D7100 is still an advanced amateur Dx camera, while the D300 is a professional Dx camera. However, Nikon released the D7100 last year as the supposed replacement for both the D7000 and D300s. The D7200 will be the pro version of the D7100. If it is, GPS and Wi-Fi will not likely be built-in as those are more consumer-level wants than professional - especially given you can already buy those options as modules. Nikon D7200 would likely be significantly more expensive so it might not obsolete the D7100, but rather be the professional version of the D7100. Rumors about the launch of the Nikon D7200 has lasted quite a long time on the Internet, and if Canon had set up a similar but more sophisticated cameras to rival Nikon D7200? There has been no official word from Canon, whether Canon will also immediately prepare a better product, so the photography enthusiasts have a choice. Expectations of photography lovers at every rumor is true how will they find, if the Nikon D7200 actually launched in September 2014, or could have been launched earlier, for example, in mid-2014. They do not want to buy a new camera like the D7200, if not no significant changes. 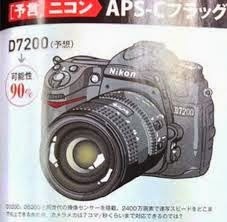 They also would be disappointed if the successor D7100 sold at high prices. With the economic crisis that has not been recovered in the United States and Europe, it is possible that the beginner will buy a camera from the previous series, and they will focus to invest in additional lenses, so they can still make creative pictures, it can even make money out of the business of photography, for example, be a photographer for weddings or business events. They may also be trying to try the opportunity to sell their photos online. The photography enthusiasts often annoyed because the latest cameras are meant to be the successor to the previous generation was only a slight change, so it is not much different from the previous generation cameras. Creativity and innovation in camera factory engineers need to work harder to deliver new surprises, for example, focus on speed, not only improves the resolution of the camera sensor, even if the need to add new features that are unique and do not exist on any camera. We expect the Nikon D7200 will also be more satisfying, so that it can compete with other DSLR cameras, even should be able to compete with the sophistication of a variety of new mirrorless cameras. Really great and insightful post! Certainly helps puts things in perspectives for those of us looking to upgrade from older DX bodies. Thanks for posting this - I'll keep my eyes peeled September time!! Wifi and gps are essential . It's really awesome to read your blog post. Yes i really enjoyed you post and information about Nikon D7200 Digital Slr Camera. Actually Nikon D7200 Digital Slr Camera is our Hot item because i'm working for Ecommerce site and we sell Photography products and electronics Gadgets. If you're interested to buy it you can visit TRD Electronics to get low rates than the market rates.